Certified Nurse Midwives are advanced practice nurses who care for women with low-risk pregnancies from prenatal care through labor and delivery. Midwives also provide a range of health care services for women from adolescence through menopause, including primary care, gynecologic and family planning services, care during pregnancy, childbirth and postpartum care. This page outlines the educational paths available to aspiring nurse midwives, as well as licensing and certification information to advance your certified nurse midwife career to the next level. The role of the midwife has been around for centuries and still plays an essential role in many modern birthing scenarios. By completing a certificate program in midwifery, students will acquire the skills necessary to care for women throughout their pregnancies, from prenatal care to delivery. By looking into specific points of data available for each school—their affordability, their rates of graduation, how many students are typically in each class—we have been able to put together of the most beneficial programs available in the country. 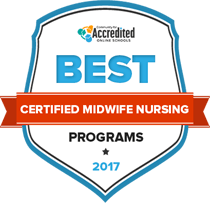 Check out what we’ve found below, and find your 2017 certified midwifery program today. A registered nurse has a wide range of experience in the health care setting, experience that can lay the foundation for a career as a certified nurse midwife. Many of the principles and practices they’ve mastered experience as an RN are applied to nurse midwifery and the required coursework to become a certified nurse midwife. Nurses are adept at supervising patients, checking vital signs and managing pain, skills that are applied to the field of midwifery, especially when working with patients in the process of childbirth. Greater care and attention is needed as midwives are responsible for both mother and child. Certified nurse midwives are adept at identifying solutions to problems in a practical setting because of their experience in working with patients of all ages. A certified nurse midwife monitors the vital signs of the woman and her child throughout pregnancy, childbirth and postpartum. Assistive technology is used. It is the responsibility of the certified nurse midwife to assess the pain of patients, including infants, and managing that pain through traditional and alternative practices. They utilize both technology and visual cues to determine the best course of action when managing pain of the mother and infant through pregnancy, childbirth and postpartum recovery. Midwives have the background to help resuscitate both infants and women in emergency situations. They work in conjunction with hospital and medical center staff to ensure that both mother and infant are cared for. Aspiring nurse midwives must have some experience in the field before they can earn certification. The journey to becoming a nurse midwife begins with an associate degree in nursing, a bachelor’s degree in nursing, or both. These degrees allow nurses to gain the practical experience they need to apply for a graduate degree and become an advanced practice nurse. Through clinical practice during education or post-graduation, practicing nurses can work with women and children to determine if pursuing a career in midwifery through a master’s degree is right for them. An associate degree in nursing is one of the fastest ways to get on the path to earning certification as a nurse midwife. Students learn the principles of the field and get clinical practice that readies them for entering a rewarding career. Earning an ADN is a good point of origin for those who know they want to work in the nursing field but want some work experience under their belts before they decide if and where they want to specialize. Aspiring nurses can earn an associate degree in the field from a community college, dedicated nursing school or from a four-year university. The degree allows graduates from accredited schools to go on to earn a higher degree. Most associate degree programs are two years long, however some nursing programs have a fast-track available, meaning that students can graduate in 18 months or even 12 months. They take courses in pharmacology, microbiology, care of children and adolescents, nursing theory and human anatomy. These core courses establish a solid groundwork that students can build upon within their careers and in future endeavors. Students also take general education courses that will allow them to pursue a bachelor’s degree and more advanced degrees in the future. A bachelor of science in nursing (BSN) allows graduates to elevate their careers, earn more money and impact more lives than an associate degree or certificate. A bachelor of science in nursing with a concentration in midwifery allows the graduate to work with pregnant women throughout their pregnancy, labor and childbirth under the guidance of a physician or certified midwife. Some nursing programs offer electives or a specialization in the field while others offer a full degree in the field. Since a bachelor of science in nursing is typically a standard requirement for advanced practice registered nurses, those who want to become midwives should pursue the degree. A bachelor of science in nursing is one of the requirements for those who wish to pursue a higher degree in the field, so consider it a must for those who seek a master’s level degree in midwifery. The curriculum dives deeper than a two-year degree and students can often focus their electives on a specific area of interest, such as midwifery. Students learn how to become leaders in their current or future workplaces and spend more time on evidence-based practice and treatment. Practical experience gives students more hands-on time, allowing them to immediately put into practice what they learned in the classroom. Courses include nursing research, public health nursing, leadership and management in the changing health care environment, statistics, genetics and other related, higher-level courses. Capstone courses allow students to demonstrate their advanced knowledge they gained throughout the program. A master’s degree in nurse-midwifery is the minimum education requirement for aspiring nurse midwives. A master’s program prepares the graduate to work with women at all stages of their lives, especially through pregnancy, childbirth and postpartum. Students acquire advanced skills and many hours of practical experience in this specialized field. A nurse midwife is an advanced practice nurse who receives advanced education to become fully licensed. They go to work in hospitals, private practice and physicians’ offices. For more information, visit our detailed page on the master of science degree in nursing. The curriculum within a master’s program targets women’s health and the care of women and infants from pregnancy to postpartum. Numerous opportunities exist for students to participate in clinical experiences, with the classes becoming increasingly hands-on. Courses include leadership and professional role issues, gynecology and health assessment and pharmacology. Because a master’s in midwifery is so specialized, there are typically few, if any, electives available and students focus solely on the core requirements. Students often have the opportunity to complete clinical experiences in a wide range of health facilities, from community health offices to hospitals to private practices. The following is a sampling of the course work that can be found in master’s degree programs for midwifery. Students look at the ethical, legal, economic and cultural issues of research practice and its relevance to health policy and patient care. Students interpret data that looks at health patterns across patients’ lifespans, including physical and mental status examinations. This course increases students’ awareness of the incidence and prevalence of violence and abuse in women. It allows the student to identify violence and be equipped with the skills to intervene and provide resource referrals to prevent further violence. Students develop diagnostic and management skills that allow them to deliver comprehensive health care to women across their life span. This course focuses on delivering basic primary gynecological care to women, from screening and contraception to the treatment of gynecological problems. Students learn how to manage the pregnancy of healthy women across a wide range of cultural and socioeconomic backgrounds. They also review complications of pregnancy, including pharmacologic and non-pharmacologic therapies and the use of technology. Synthesizing knowledge from all aspects of nursing care, students participate in clinical experiences that include managing family care during labor, birth and postpartum. This course synthesizing all curriculum, focusing on allowing the student to refine and manage skills. Students learn to operationalize the role of the nurse midwife in the care of women in larger health care delivery systems. The process to becoming a certified nurse midwife is much like earning other advanced practice nursing certifications. An aspiring midwife starts by earning a bachelor’s degree in nursing and passing the state licensing requirements to become a registered nurse. The RN then spends time working in the field and gaining real-life experience. It’s recommended that the nurse work in a gynecological practice or working with infants to gain even more experience prior to pursuing a higher degree and certification. Generally, two years of practical experience in a midwife-related field are required. A master’s degree in midwifery is then required, followed by certification through the American College of Nurse-Midwives Certification Council and state licensure in the field. State licensure requirements vary and applicants are encouraged to check with their state licensing center prior to completing any program to ensure they are on track. Those pursuing a master’s in midwifery must attend a school with a program accredited by the Accreditation Commission for Midwifery Education exam. Only graduates of an ACME program are eligible to sit for the national CNM exam, which costs $500 to take. Exam applicants are required to provide proof of RN licensure, hold a graduate nursing midwife degree and provide two letters from the director of the applicant’s graduate program addressing the completion date and the applicant’s abilities. Credentials must be renewed every five years. Midwifery is a growing field, expected to grow by 22 percent from 2008 to 2018 according to the Bureau of Labor Statistics. Practicing and prospective professionals can receive support from a variety of organizations including the Midwives Association of North America and the American College of Nurse Midwives.